Maps make the world go round, even when the mapmakers still thought the world was round. There is a wealth of literature on Islamic miniatures found in manuscripts stemming back centuries, but there is less knowledge about the many maps in these manuscripts. 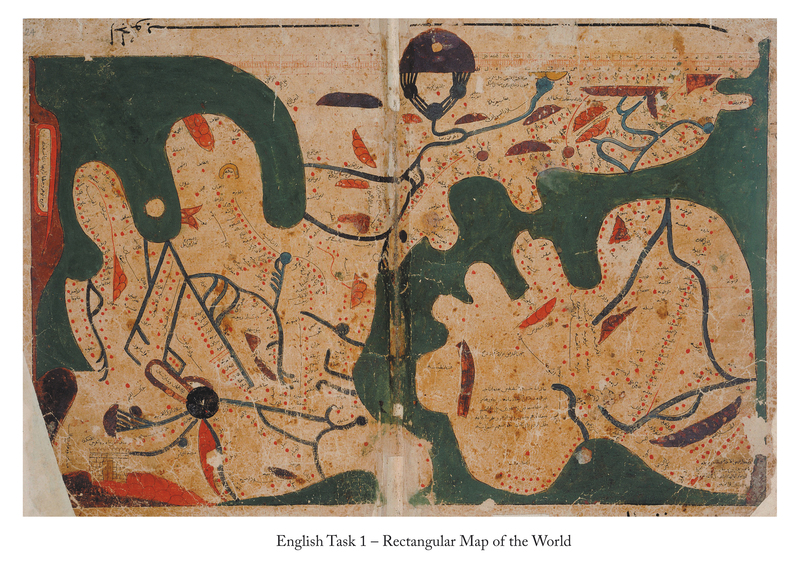 If you are interested in the history of mapmaking in the Islamic world, the best place to start is with Karen Pinto’s Medieval Islamic Maps (2004). Pinto notes that over 1,000 maplike images are known. 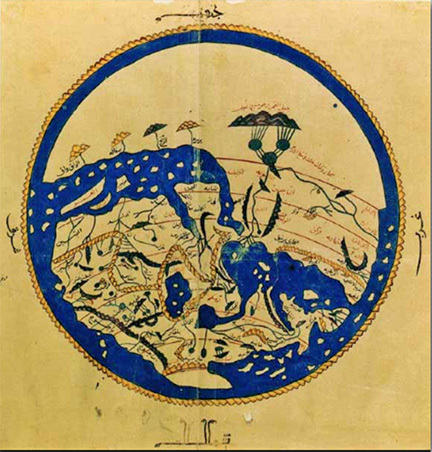 For the surfer, several of the more important world-at-the-time maps are available on a website with “Medieval Islamic World Maps” and at 1001 Inventions. One of the more famous maps is that created by the geographer al-Idrīsī (d. 560/1175), who was a scholar at the court of Roger II in Palermo, Sicily. When you first look at his map, you may be confused. It is all a matter of perspective. 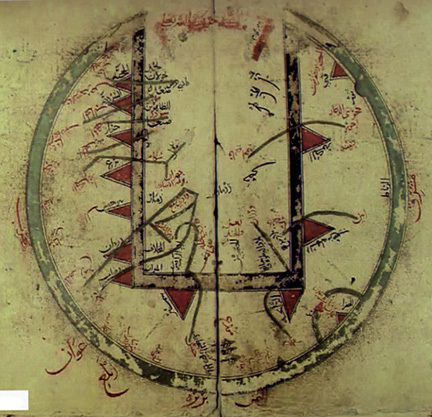 We are used to orienting maps to the north, but for al-Idrīsī this would be upside down. The body of water that at first might be mistaken for the Mediterranean is actually the Indian Ocean under an exaggerated sense of Africa. Turn the map 180° and the outline will be clearer. The importance of these early maps is not their accuracy, which would have been impossible until techniques were developed to accurately place geographical coordinates. As Pinto (p. 280) suggests: “Maps are not territory; they are spaces, spaces to be crossed and recrossed and experienced from every angle. the only way to understand a map is to get down into it, to play at the edges, to jump into the center and back out again.” The point is well taken that map is not territory but a schematic representation that serves as a guide to making sense of territory. Such guides are often in a person’s head, as for the Bedouin in the desert making his way based on the stars and local landmarks. But when they are drawn, they say as much about the idea behind drawing it as what is being represented. Beyond world maps there are also regional maps, often more important for their placenames. 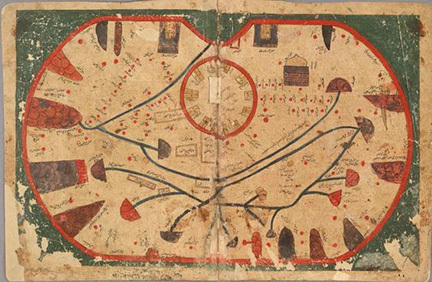 An example is the early 14th century map of Rasulid Yemen in a tax document. This one is oriented to the north, towards Mecca. There are almost 100 placenames, some for fortresses (red triangle), some for ports, others for towns and wadis. While the main purpose of the text is to record tax revenues, the map suggests what parts of the realm were most important to the Rasulid court. The surviving manuscript has 17 maps, covering the major tax regions. 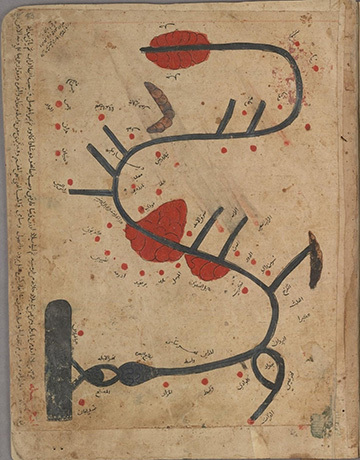 One of the more interesting manuscripts with maps is the book Gharāʾib al-funūn wa-mulaḥ al-ʿuyūn’ (The Book of Curiosities of the Sciences and Marvels for the Eyes), now housed at Oxford University. This has a rectangular map of the world, which you can circumnavigate online. It also has a map of the Tigris River, which you can also see up close online. If you want an island map, this text has an overview of Sicily as well. Or, if you prefer, try the book with the Arabic and a translation.